There are currently twelve provinces of the Netherlands (Dutch: provincies van Nederland), representing the administrative layer between the national government and the local municipalities, with responsibility for matters of subnational or regional importance. The most populous province is South Holland, with over 3.65 million inhabitants in 2009. With approximately 381,500 inhabitants, Zeeland has the smallest population. In terms of area, Friesland is the largest province with a total area of 5,749 km2 (2,220 sq mi). If water is excluded, Gelderland is the largest province in terms of area at 4,972 km2 (1,920 sq mi). Utrecht is the smallest at 1,385 km2 (535 sq mi). In total about 13,000 people were employed by the provincial administrations in 2009. The provinces of the Netherlands are joined in the Association of Provinces of the Netherlands (IPO). This organisation promotes the common interests of the provinces in the national government of the Netherlands in The Hague and within the European Union in Brussels. The States-Provincial (Provinciale Staten) is the provincial parliament elected every four years. The number of members varies between 39 and 55 (as of 2015), depending on the number of inhabitants of the province. Being a member is a part-time job. The main task of the States-Provincial is to scrutinise the work of the provincial government. The Provincial-Executive (Gedeputeerde Staten) is a college elected from among the members of the States-Provincial and charged with most executive tasks. Each province has between three and seven deputies, each having their own portfolio. The task of the Provincial Executive is the overall management of the province. The King's Commissioner (Commissaris van de Koning) is a single person appointed by the Crown who presides over the States-Provincial as well as over the Provincial Executive. The Commissioner is appointed for a term of six years, after which reappointment for another term is possible. The members of the States-Provincial are elected every four years in direct elections. To a large extent, the same political parties are enlisted in these elections in the national elections. The chosen provincial legislators elect the members of the national Senate within three months after the provincial elections. The elections for the water boards take place on the same date as the provincial elections. The last three provincial elections were held in 2007, 2011 and in 2015. Sustainable spatial development, including water management. To a large extent, the provinces of the Netherlands are financed by the national government. Also, provinces have income from a part of the Vehicle Excise Duty. Several provinces have made a large profit in the past from privatising utility companies originally owned or partly owned by the provinces. Essent, which was originally owned by six provinces and more than a hundred municipalities, was sold for around 9.3 billion euros. The country of the Netherlands, being the largest part of the Kingdom of the Netherlands, is divided into twelve provinces (provincies in Dutch) and three overseas special municipalities, the Caribbean Netherlands that are not part of any province. Previously these were part of public bodies (openbare lichamen). 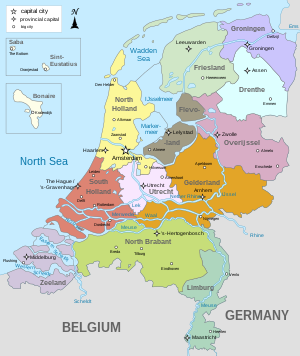 ^ Friesland in Dutch; the official name Fryslân is in the West Frisian language. ^ Grönnen in Gronings; Grinslân in West Frisian. ^ Also Den Bosch in Dutch. ^ a b Amsterdam is the national capital of the Netherlands. Haarlem is, however, the capital of the province in which both Amsterdam and Haarlem are situated. ^ Den Haag or ​'s-Gravenhage in Dutch. The Dutch parliament and the Dutch government are located in The Hague along with the Supreme Court and the Council of State. Nearly all Dutch provinces can trace their origin to a medieval county or duchy, as can the provinces of regions in Belgium. Their status changed when they came under a single ruler who centralised their administration, reducing their powers. There were 17 in total: from these unified Netherlands, seven northern provinces from 1588 formed the Republic of the Seven United Provinces, namely Holland, Zeeland, Gelderland, Utrecht, Friesland, Overijssel and Groningen. The Republic's lands also included Drenthe (one of the 17, but without the autonomous status of the others), and parts of the Duchy of Brabant, Duchy of Limburg and County of Flanders, which were considered to be "conquered lands" and were governed directly by the States General, hence their name Generality Lands. They were called Staats-Brabant, Staats-Limburg and Staats-Vlaanderen, meaning "governed by the States General". Each of these "Netherlands" had a high degree of autonomy, cooperating with each other mainly on defense and foreign relations, but otherwise keeping to their own affairs. On 1 January 1796, under the Batavian Republic, Drenthe and Staats-Brabant became the eighth and ninth provinces of the Netherlands. The latter, which had been known as Bataafs Brabant (English: Batavian Brabant), changed its name to Noord Brabant, North Brabant, in 1815 when it became part of the United Kingdom of the Netherlands, which also contained (then) South Brabant, a province now in Belgium. This new unified state featured the provinces in their modern form, as non-autonomous subdivisions of the national state, and again numbering 17, though they were not all the same as the 16th century ones. In 1839, following the separation of Belgium, the province of Limburg was divided between the two countries, each now having a province called Limburg. A year later, Holland, the largest and most populous of the Dutch provinces, was also split into two provinces, for a total of 11. The 12th province to be created was Flevoland, consisting almost entirely of reclaimed land, established on 1 January 1986. There is continuous discussion within the Netherlands about the future of the provinces. Before 2014, the national government was planning to merge the provinces Flevoland, North Holland and Utrecht into a single province (Noordvleugelprovincie). Due to significant protest the plan was abandoned. ^ (in Dutch)IPO: did you know about the provinces (in Dutch). ^ "Regionale kerncijfers Nederland". CBS Statline (in Dutch). CBS. 16 December 2013. Retrieved 19 December 2013. ^ "Regionale kerncijfers Nederland". CBS StatLine (in Dutch). 13 December 2017. Retrieved 4 January 2019. ^ "Regionale kerncijfers; nationale rekeningen" (in Dutch), GDP by province according to Statistics Netherlands. ^ ICTU. "Overheid.nl - Standaard elementen". almanak.overheid.nl. ^ Luious, Bizaan (4 August 2014). "Alle kortingscodes om flink te besparen". www.kortingscodeplein.nl. Retrieved 27 July 2017. ^ "Geen Noordvleugelprovincie - Provincies" (in Dutch). Ministerie van Binnenlandse Zaken en Koninkrijksrelaties. Retrieved 27 July 2017. "Provinces of the Netherlands". Statoids.